On recordings and sometimes live Lys Guillorn also plays 5-string banjo, lap steel, organ, Rhodes, mandola, mandolin, tenor banjo, toy piano, various other things with strings, bells n' whistles. Lys Guillorn is a singer/songwriter, multi-instrumentalist, and multi-disciplinary artist based in Shelton, Connecticut. She is of the same musical school as Laura Veirs, and Kristin Hersh, with a little Emmylou Harris thrown in: dreamy, lyric-driven, melodically interesting, and undefinable. She calls her genre of music "Avant-Twang." Guillorn has opened for artists including: Robyn Hitchcock, Richard Buckner, Laura Cantrell, Amy Rigby, Scout Niblett, The Handsome Family, and Nora O'Connor. I'm a Boy EP picks up where Sunny Side Down left off--garage rock with a live feel recorded at Cheshire's Bonehead Studios. This is the first recording documenting the four-piece as a band. 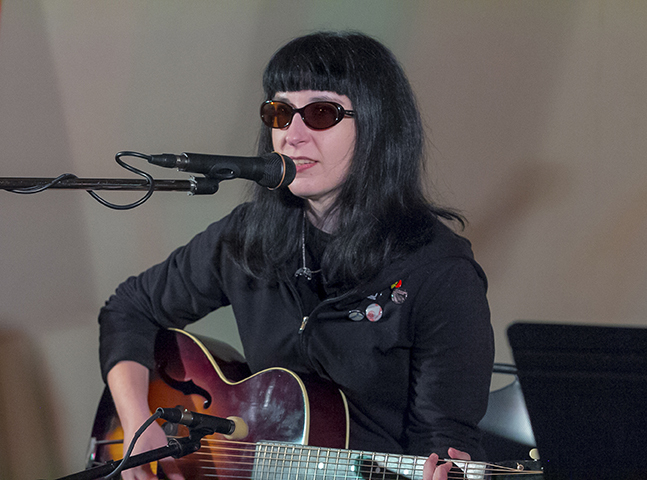 Since 2017, Lys Guillorn has released several singles including her most recent, Chipped Fingernails, released on February 1, 2019 in a split single with Julie Beman. No Line North - Dreams of Trees Pt. 1 (2017) - harmony vocals on "Butterflies"
"The New Haven-area singer has put out the occasional single or short EP in the intervening years, and released a second LP, Winged Victory, in 2013. Each addition to her discography has felt like a welcome gift — if never quite enough. The same holds true for her latest, the double single Sunny Side Down, released as Lys Guillorn & Her Band. Playing at the head of a trio that features drummer Peter Riccio and bassist Eric Bloomquist, the songs find Guillorn in a more rocked-up mood than her more typical haunting avant-folk. It suits her. On the title track, she sings in sultry tones, letting her assured vocals ring over a rise-and-fall bassline and jangling electric guitars, underpinned by a subtle Hammond organ part. 'Spin Cycle,' the second half of the release, has political overtones as Guillorn sings, “Remind me again/ the difference between/ lying and spin,” and her tone is pitying over a stuttering rhythm that turns splashy on the chorus, and warm, gritty electric guitar. Together, the two songs are just enough to hint at a new creative direction from Guillorn. Or maybe they’re more a demonstration of the breadth of her ability. It’ll be hard to know for sure until she returns with the next batch of songs, and even harder to wait until they arrive." "It's probably safe to make such a bold claim as the following: Lys Guillorn is one of the best songwriters in Connecticut right now. She writes haunting and compelling melodies and poetic but entirely accessible lyrics, and her songs are prone to unexpected turns (both lyrically and structurally). She frames them by playing in a sort of Gothic art-country/folk-rock mode, airy and often spooky but also raw, heartfelt and dynamic." Thakns: Peter Gaulin (bass 1998-2000), Matt Moadel (drums 1998-2000, 2006), Pete Brunelli (bass 2003-2004), Chris Lough (keyboards/accordion 2003-2004), Mike Conklin (bass 2005), Julie Riccio (backing vocals 2003-2004), Ryan Blessey (guitar, lap steel, 2004-2009), Mike Guillorn (bass 2006-2009). Dates might be approximate.